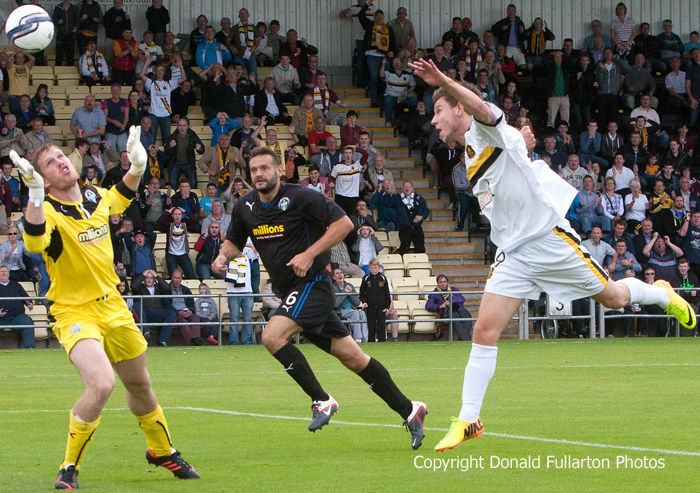 DUMBARTON fielded two new signings and bounced back from the previous week's disappointment with a convincing 3-1 home win in the local derby against Morton. DUMBARTON fielded two new signings and bounced back from the previous week's disappointment with a convincing 3-1 win in the local derby against Morton at the Bet Butler Stadium. Allan Moore's Greenock side made a spirited bid for the first division title last season, only to be pipped by Partick Thistle, and they are hoping to be in the top of the table mix in the new SPFL Championship this season. However Dumbarton, determined to come back well after the previous week's 4-1 defeat at Hamilton, produced a fine performance, helped by new signings Colin Nish up front and Hugh Murray in a defensive midfield role. Sons opened the scoring midway through the first half when Mitch Megginson headed home at the second attempt, but a minute later Morton's Dougie Imrie was fouled in the box, took the penalty kick himself, and equalised. Not long before half-time the home side took the lead they deserved when the towering Nish showed all his experience to roll the ball home, rather than blast it, from a narrow angle. After the break Morton had more of the possession but rarely looked dangerous, with home keeper Jamie Ewings having to make only one save. Victory for Ian Murray's side was confirmed shortly before full-time when sub Steve McDougall headed powerfully into the net. The picture shows Megginson heading the opener.